Madison Lane Interiors: Add some color to your life! After putting up the Christmas decor, the shop needed a fresh color scheme. We almost reached for the paint brushes, but on second thought . 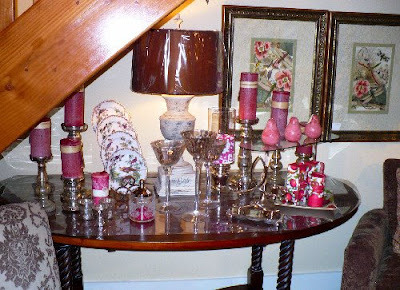 . . .we gathered some colors together we hadn't seen for awhile, and set up some new vignettes. Maybe the paint brushes will make an appearance in the Spring!! 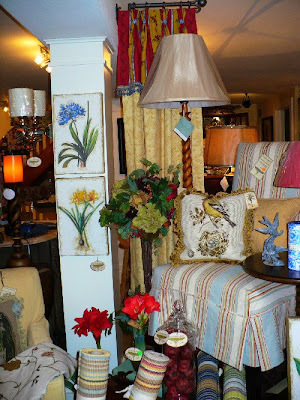 Walking into the shop from the front door you are greeted with bright reds, bold yellows, and several shades of blues. It just takes a small amount of fabric to add some pop to a window treatment or even pillows. Look around your own home, you might be surprised what a simple add-on like buttons can do to add your own pop of color! 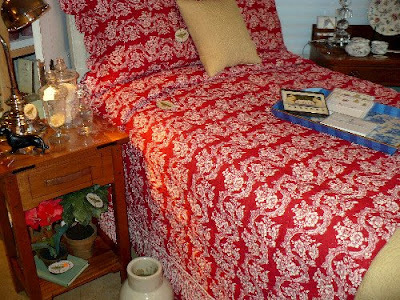 Don't forget the bedroom for a color change. The reds can change from Christmas to French Country by adding in some blues and golds. Check out the Pierre Deux website and see how they do it. 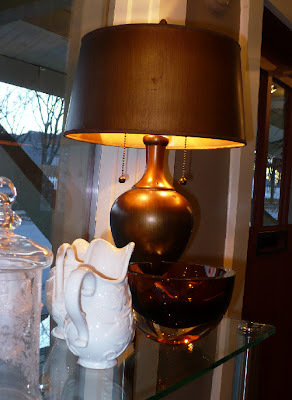 OK, so bold color isn't for everyone, but even the white pitchers get more attention next to the bronze lamp and bowl. It's the contrast that grabs your attention. We didn't forget green, but I'm not showing that vignette. You'll have to come by and see that one for yourself! Pump up the volume----on silk! Making and plan and sticking to it!